After docking with the station’s Rassvet module, the Soyuz MS-09 crew—Russian cosmonaut Sergey Prokopyev, NASA astronaut Serena Aunon-Chancellor and European Space Agency astronaut Alexander Gerst—spent a couple hours pressurizing the space between the hatches of the two vehicles. 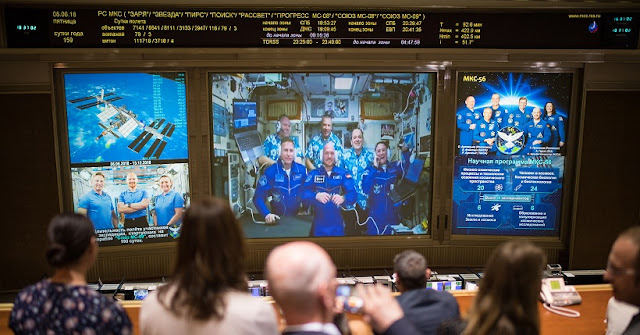 Official hatch opening time occurred at 11:17 a.m. EDT (15:17 GMT) while the outpost was flying some 255 miles (410 kilometers) over the southern Pacific Ocean. Soyuz MS-09 launched atop a Soyuz-FG rocket at 4:12 p.m. local Kazakh time (7:12 a.m. EDT / 11:12 GMT) June 6, from Baikonur Cosmodrome. The trio spent 34 orbits inside the tiny Soyuz spacecraft, which only has a livable volume of some 300 cubic feet (8.5 cubic meters)—about the size of a walk-in closet—between its two habitable compartments, the descent module and orbital module.